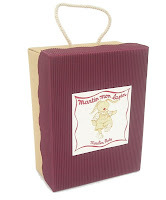 One of the two new Moulin Roty ranges now available exclusively through Cottontails in the UK is Martin le Lapin, based around a little French cream and red rabbit. (Martin seems an unlikely name for a bunny, but we must remember that he is French and therefore should pronounce him 'Martan'!) 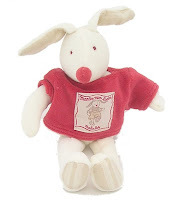 At the heart of the range is the soft toy rabbit, a 30cm Martin wearing a check cotton shirt and red and fawn dungarees. 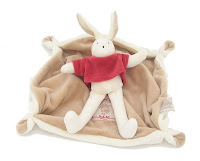 He is a very cuddly fellow with long ears and dangly limbs and as with most Moulin Roty toys he can be dressed and undressed. 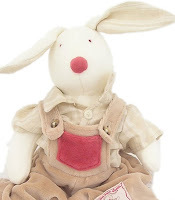 Along with the soft toy we then have rattle, comforter, musical rabbit and a lovely range of nursery accessories. 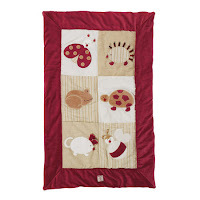 All the toys come gift boxed and the range is ever so reasonably priced - certainly a little less than usual Moulin Roty pricing, for example the comforter is £11 and the rattle £10 - and both come in lovely boxes. We are thrilled to have Martin with us and hope he will be very happy at Cottontails!